With the recent increase of sunny days in the Pacific Northwest, my garden is growing by leaps and bounds. Each day — morning, noon and evening — we wander through it to collect ingredients for our next meal. As my family enjoys the fruits of our labors, it seems to be the perfect time to reflect on how influential the garden has been on the new items I've created for the 2012-2013 Kata Golda collection. So for the next few weeks, I'll focus on different items from my garden and give a sneak peak at the work they've inspired. 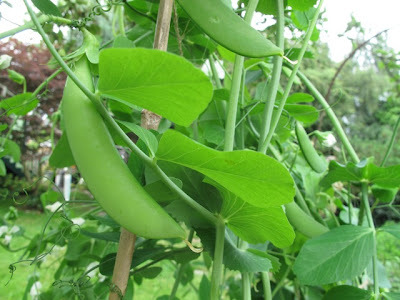 The plentiful pods in my pea patch have a great ability to hide. I always need to walk through the pea patch two or three times to make sure I did not miss any of the perfectly plump pods. Yet inevitably I do, because when I return the next morning I find it hard to believe how the engorged pods I find could have possibly grown that big overnight. As someone who handcrafts a lot of items for babies, the pea pod is a real favorite image of mine. The pods act as the momma, protecting the little baby peas inside as they mature and grow sweetly plump. The felt "Peapod" Heirloom pocket comes with a letterpress printed baby record, with a place to record a name, birthdate, and other details of your baby's milestones, including a place to paste a photo. 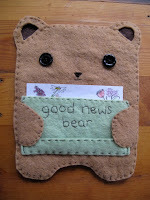 The pocket gives you a place to store other memorabilia, and can be personalized with a hand-stitched message. 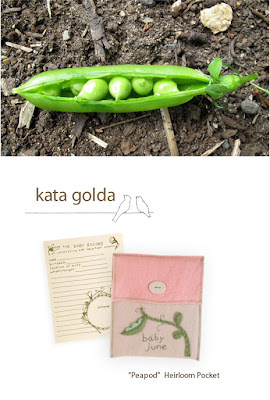 Studies of a pea pod for the 2012–2013 Kata Golda catalog. 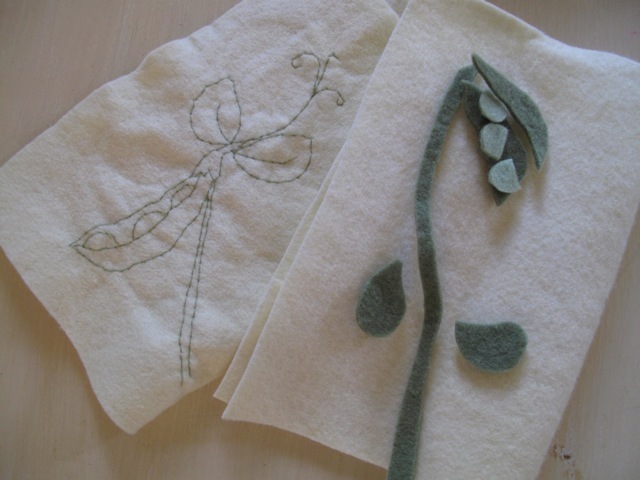 On the left is a hand-stitched design; on the right are the pieces to a design I cut from felt, which I will then stitch together. 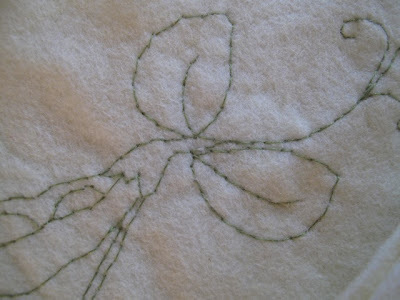 A detail shot of the pea pod design I "drew" with needle and thread. The connection to make between these studies of my garden and my new plush Pea Pod toy is an easy one. 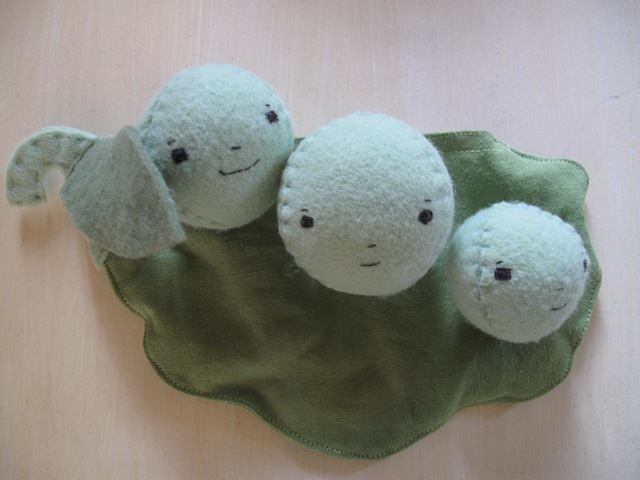 Three cheerful round pea pods, each a different size and made from hand-dyed wool felt, sleep soundly in the belly of their pod case. The faces are hand-stitched, and the pod stays shut with the help of a hook-and-loop closure, making it friendly for your little ones. The material for the pod is a 50% organic cotton / 50% organic hemp blend that is new to the Kata Golda collection. 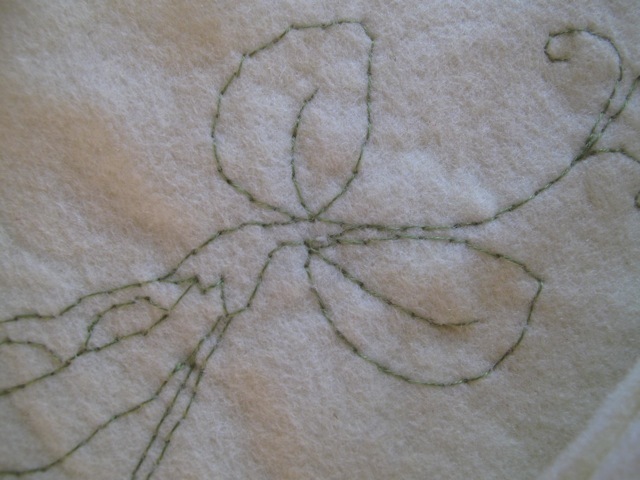 Look for this and other new items inspired by the pea pod in late 2011.